Today’s catblogging demonstrates the changing of the guard around here. 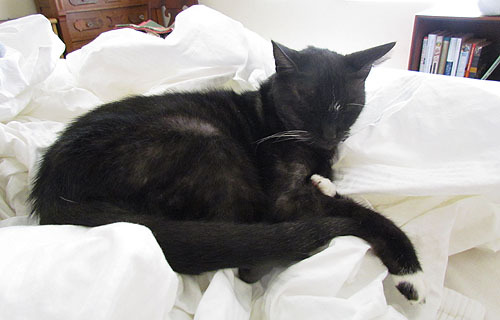 For many years, freshly laundered sheets were Inkblot’s exclusive preserve. In fact, the entire bed was his exclusive preserve. I guess he chased Domino off it once too many times. But that’s slowly changing, and Domino is now spending increasing amounts of time curled up at our feet. Last week, for the first time in years, she gingerly sidled up to a pile of lovely, warm sheets, twirled around a few times to get her bearings, and then promptly fell asleep. Today, however, she is being forced to take terrible, nasty, yucky little green pills. It’s for her own good, but she doesn’t believe us and she’s fighting pretty hard against the indignity of it all. It’s only going to get worse over the next ten days, and I’m hoping the vet tells us we can just crush them up and put them in her cat food. We’ll see.